This is a request from a prospective client looking to rank #1 on Google. This anecdote is not in poor taste or an attempt to disparage future clients. It is to showcase that what clients think we should do is not what we actually do. No single SEO technique will cause a website to dominate search results or Google Maps. Instead, Google grades websites and listings on a variety of factors in combination. We are talking about hundreds of different variables. Think of the highest ranking websites as those that have the highest total grade. A company excelling in one area will not compete with one that has divided resources into a wide range of different areas including content, design, and reputation. Sometimes inquiries will ask for content only. While many in the industry have peddled the saying “content is King” they are all lying. Don’t get us wrong, content is very important but it is only engaged in correlation with other factors. Try writing a page of content about your service on a free blog. Wait 6 months and let us know if it optimizes. We’ll save you the trouble, it won’t. Not because the content wasn’t well-written or because you failed to use keywords in your H1 but because Google and its users could not care less about the page that it is written on. Have you ever seen a visually appealing website buried on page 10? Probably not, but only because nobody ever looks on page 10. The truth is that plenty of great-looking websites don’t rank well on Google. Design is not always about the front-end (i.e. display) but even sites that are properly coded and look great don’t automatically rank on page 1. Having a great design without a content marketing strategy or a Google My Business listing and embedded map will ultimately fail to make a difference. Design is extremely valuable as one piece to a bigger puzzle. The businesses that have 500 5 star reviews will always rank #1 on Maps, right? Wrong. See for yourself, there are many contractors with great reviews that are not appearing on the Local 3 Pack. This is because they don’t grade well in other aspects of their online presence. One common reason why Maps rankings fail to place where their reviews would suggest is the lack of relevant content on their website. To show up on Maps for specific services, they must be mentioned on your website. When Google spiders pages, they associate topics with listings. Your contractor service must be represented by a custom website that is optimized for search. SEO is the most efficient and affordable way to generate leads but it only reaches its potential with custom design. Template websites are a disservice to SEO and will hinder your efforts to secure rankings for relevant keyword terms in your service location. SEO is worth every penny. Our websites include 100 schema markup points that help Google parcel your data and index it. Nobody wants to read through boring blocks of text, especially if they are grammatically incorrect, off topic, and lack a satisfaction of the user’s search intent. The reader of your content came to your website for a reason. It is your job through content creation to make sure that reason is justified through their on site experience. Do they have a question? Do they need a piece of information? If so, your content must clearly and conveniently showcase that to them. Getting your Google Maps listing to show up for relevant keyword terms requires full optimization of your Google My Business profile, company website, and the integration of them as a singular representation of your company. While a search of your brand name will prompt Google to display your Maps listing irregardless, showing up for keyword terms that people search for organically requires a deep content structure on your website explaining services. Targeting a referral group on Facebook narrows your audience and increases conversion probability. Facebook ads can be displayed to people based on demographics that are highly relevant to your business strategy. For example, someone who is listed as a “homeowner” is more likely to need contractor services than someone living in an apartment complex. These kinds of pinpoint marketing tactics can limit spending while increasing ROI. Template websites are becoming a problem online. Too many contractors use run of the mill templates to showcase their services. These templates are not optimal for SEO and their coding structure leaves something to be desired. Custom websites can have full and in-depth schema markup while also optimizing for site speed, particularly on mobile. The code is custom and original and stands out to Google crawlerbots among the sea of monotony that competitors utilize. Google Ads (formerly AdWords) is one of the fastest ways to earn clicks online. Earn might be the wrong word actually, although well-designed ads to get credit over ones that lack execution. But for the most part, PPC clicks are paid for and therefore are not earned organically. PPC campaigns when managed properly can yield serious ROI but can also be a net negative when handled by a novice. PPC also lacks the sustainability of SEO. Facebook is not only good for traditional advertising but also for remarketing. When someone visits your website their browser stores what is known as a “cookie.” Facebook can than track this cookie and advertise to users as they browse the social network. This narrows your audience once again to people who’ve already demonstrated interest in your services by previously visiting one or more of your published web pages. Many contractors fall into the trap of only going for primary keyword terms through webpages. The truth is, contractors, especially those who are newer, should target low volume keywords. These keywords are lower in search volume but have a greater chance of ranking higher, faster. For example, hose bib replacement is not something most people will search for. But enough will that having a top 5 ranking webpage for it can convert. This might sound like a cliche but it is actually quite literal when it comes to website work. Ongoing work on a website is what prompts Google to continue to crawl it and index its pages as they are updated. By displaying the most up-to-date pages, you can overtake competitors who have become stagnant. Google has always loved ongoing work, which is why contractors should too. Signaling to search engines that you continue to work is great for SEO. Contractors need reviews to turn visitors into leads and oftentimes to get the visitor to begin with. Local Maps results are often contingent upon the quality and quantity of business reviews. You can generate reviews ethically by installing the Righteous Reviews widget (included with Contractor Webmasters SEO package) which makes the review process more convenient for customers by having them directly on your website. They are dispersed to Google and Yelp and also send text reminders to customers. Converting customers on your website should be part of “the basics” for contractors. Yet so many of the sites we see lack the elements that increase conversion rates. A lot of this stuff is pretty obvious as the goal is to get visitors to contact you as conveniently for them as possible. Contractor Webmasters helps roofers, hvac technicians, plumbers, foundation repair specialists, and more, turn their website into a lead generation asset in 2019. Homeowners looking for a contractor are not really looking to read a novel. What they want is a way to contact you quickly. A clear display of your phone number is the best way for them to reach you. The number should be displayed prominently on the top of your website. It also helps if the number contains click-to-call functionality which is especially useful for mobile users. 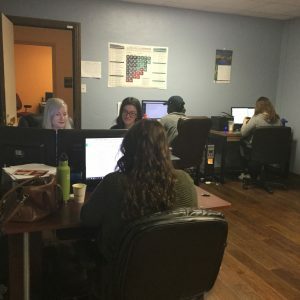 With clickable phone numbers, they can connect directly to your line ASAP. Not every prospective customer is going to want to talk with you immediately. They might prefer to leave their information so that they can talk to you at a later time. Since many people browse the web on lunch breaks, or even during work hours, they don’t always have the luxury of starting a phone conversation. Contact form submissions aren’t as high quality of a lead as direct phone calls, but they can become higher in quality in some cases. 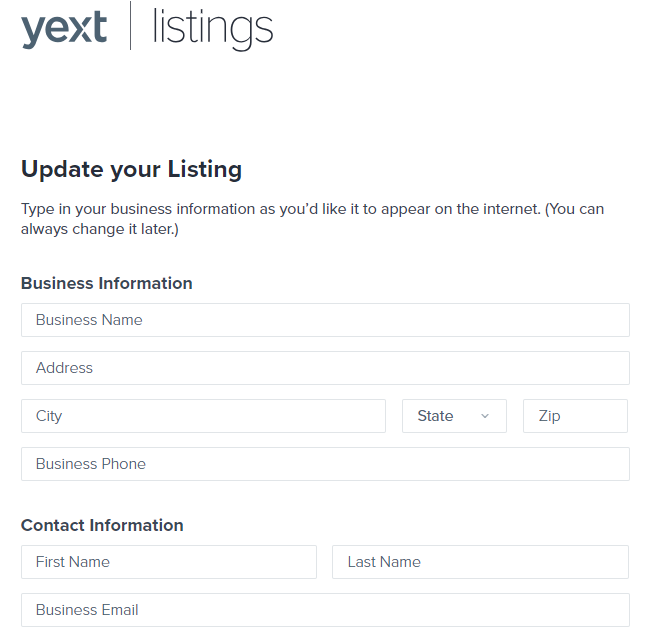 Your website’s footer should list your business address for several reasons. First and foremost it gives legitimacy to your company. People prefer to know precisely where you are located. Secondly, there seems to be significant SEO benefits to listing your address. While Google My Business has made addresses optional, research shows that addresses matching on your website and GMB listing provide a cohesive optimization boost. Without visitors, conversion rate optimization is worthless. That’s why the first priority should be search engine optimization. By driving relevant traffic to your site you can give yourself the opportunity to convert those visitors into customers. That’s why any marketing company who focuses on conversions without traffic is leading you down the wrong path in 2019. Listen to today’s episode to learn more about website conversions and how they can influence your business this year. They way people consume information in 2019 is far different than it was as recently as a decade ago. This is especially true when we are talking about internet connected content. Everything from Netflix streaming to Apple podcasts are hosted on an online server and can be dispersed to the masses with either a WiFi or home connection. Contractors might not think of themselves as the type of business that could leverage this new normal, but they are incorrect. Video and podcasts have become two perfect mediums for contractors to distribute original content. Platforms like YouTube and Apple allow for any type of contractor to create a brand voice and one that will more personally connect them with their current and future customers. What Kinds of Videos Should Contractors Make? Contractors should make videos of their employees on the job, as well as profiles on certain team members and personal messages to customers. How Can I Rank My Video on Google? They will help increase conversion rates by connecting with users on a more personal level. This is true both on your website and on a channel like YouTube. Podcasts have not been popular quite as long as videos, but their ascendance into the mainstream has put multiple industries on notice. People listen to podcasts on there way to and from work, and even sometimes while they are working. Podcasts are available on an abundance of popular channels including Apple and Spotify, most notably. Like with video, contractors often have difficulty seeing themselves as worthy of podcast content. The reality is that there is a market for everything online. Not only that, but establishing a podcast helps build your brand and sends signals to Google that your company is serious about consumer outreach. This can be reflected in your overall search visibility, especially as it pertains to higher rankings. What Should Contractors Talk About? How Many Podcasts Episodes Do Contractors Need? That depends. Usually one per week is enough to keep your podcast feed active. Videos and podcasts have a nice collective influence over SEO. When Google parcels what we call rich media (videos, podcasts, etc.) they reassess the valuation of a web presence. In the case of contractors, establishing high quality videos and, or a high quality podcast, can quickly separate you from competitors within your niche and location. Since not as many contractors are focused on this kind of content creation, an existing marketing inefficiency is available for the taking. When aligned with a larger SEO strategy for contractors, the combination of these two media types can push a low ranking contractor the top page of Google results. Video and audio content are not only limited to their native platforms. In other words, videos are not confined to YouTube, nor are podcasts to Apple. All of these media types can be syndicated across various platforms and even in some cases, re-uploaded as separate files. An example of the former example would be embedding YouTube code within the HTML of your company website. This way, it is not only available on YouTube but on your website as well. A podcast example would be a episode that is streamed on your RSS feed and distributed to Apple, Spotify and more. The latter example involving a separate file would deal with an additional video file being uploaded to a different web platform like Vimeo or perhaps even Facebook’s native video upload. The HVAC industry is a competitive landscape. In order to keep your business on top, your HVAC marketing must be superior to your competition. However, with all the current marketing options, how do you know which HVAC marketing strategies will get you the most leads? In the modern advertising landscape, digital marketing is the most productive way to advertise your HVAC company and generate leads for your team. But how do you use digital media to market your HVAC business? Beneficial online marketing stems from great SEO which maximizes website traffic, search appearances, and even social media engagement, leading to more HVAC leads. Search Engine Optimization is the Key to Being Found on Google. The modern HVAC advertising landscape revolves around digital marketing strategies. These methods can include a productive HVAC website, social media accounts, directory listings, and much more that work together to provide high rankings on search engine results pages (SERPs) and other online outlets. In fact, studies show that online advertising returns the most ROI out of any marketing channel. It’s also one of the least expensive advertising outlets, providing low-cost and even free traffic generation. Digital Marketing and Advertising Expands Your Reach Without Busting Your Budget. Getting your business to rank well on SERPs and social platforms is easier said than done. So how do you compete in the digital world? The only proven method of ranking better in the online world is creating an impeccable SEO plan. Great SEO uses keywords, content, coding, and other key components to build and easily-read map for Googlebot crawlers to inspect and index your subject matter and present it to interested searchers. These tactics are called “white hat SEO tactics” and are the most useful and productive. Using white hat tactics instead of black hat, or discouraged, methods will improve your chances of appearing in SERPs while simultaneously preventing penalties and other discretionary occurrences. 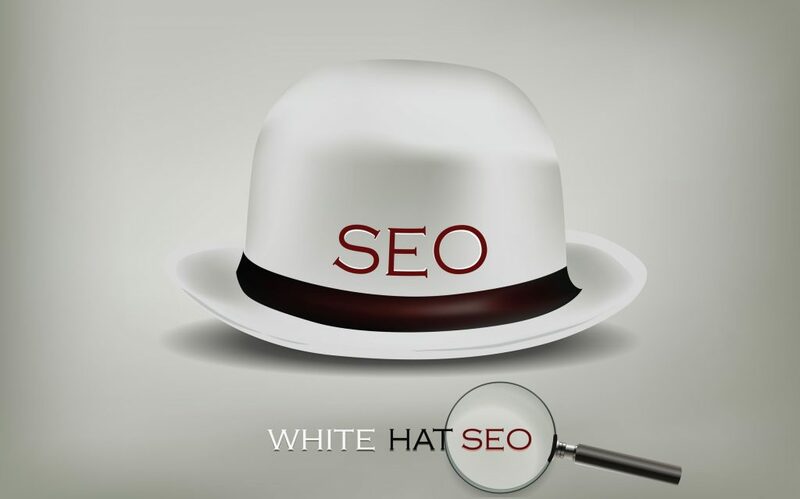 White Hat SEO is a Term Used for Productive, Up-and-Up SEO Practices. In order for Google to present the best search results possible to its searchers, it uses frequently updated algorithms to judge websites’ usability, relativity, and quality. Google bots crawl every website and account to find the most relevant information which is then presented on SERPs in order of relevance and user experience. While these algorithms change often, they use the same basic data to track every website online- content quality, keyword relevance, and online authority. Fortunately, there are HVAC SEO strategies to help get your business seen more often throughout the digital landscape. Off-site SEO is composed of all the efforts that lend to increased website traffic. 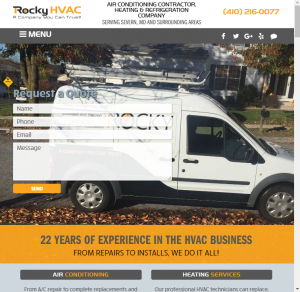 Components like backlinks, directories, and social media accounts can drastically increase your HVAC website traffic and create more online authority for your company, resulting in higher SERP rankings. Off-site SEO also helps bolster your Google Home Page by offering varied indexable content. However, they must be utilized correctly in order to be effective. They must be structured correctly, have useful content, and represent your business effectively. Off-Site SEO Helps Promote Your HVAC Business on Multiple Channels. Site Authority: How authoritative is the site you’re linking to? Does this site produce quality content? Does it have a regular following? The higher the linking site’s authority is, the higher the link equity will be. Anchor Text: How will your link be used? To ensure quality results, the anchor text on the linking site should include keywords that are relevant to your site. Freshness: The older a link, the less it contributes to your overall SEO performance. Continuously add new content to help create link opportunities. Relevance: Links that lead to irrelevant content are useless. Ensure your links are connected to relevant sites with quality content to get the most success. Backlinks Provide Many Benefits Like Domain Authority, SERPs Entries, and Extended Reach. While establishing quality backlinks can be time-consuming and tedious, the effort is definitely worth it. Backlinks deliver extended content, a widened customer base, and more online authority, all of which promote your business in SERP rankings. However, poor backlinks do not help with SEO and can even hurt your company’s SERP performance in many cases. These backlinks may stem from poor quality websites, link farms, and other sources that are more focused on link quantity than quality. Ensure you are always using quality backlinks for your site by promoting quality content and sharing regularly to social media platforms. Online directories are a great start for great backlinking to your site and also contribute to local SEO efforts. These listings, often referred to as NAP (Name, Address, Phone) citations, can provide superior SEO qualities which can increase rankings, facilitate more SERP appearances, and offer backlink opportunities. When you advertise your business in top directories like Angie’s List and HomeAdvisor, it creates a link back to your site. However, it also creates a secondary location where your business’ location and service information can be found, presenting your site as more authoritative and knowledgeable to Googlebot crawlers. Directories such as ThumbTack, Yelp, and the Better Business Bureau provide excellent sources of information logging to maximize link effectiveness and increase Google Rankings. 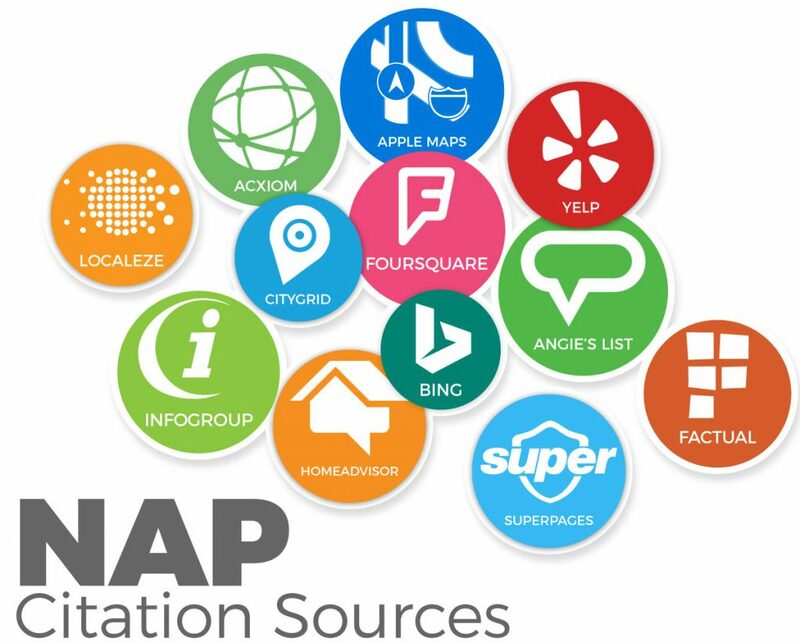 NAP Citations Provide a Multifaceted Online Presence for Your HVAC Company. When creating citations for your HVAC business on directory sites, remember to list your company’s name, address, and phone number exactly the same throughout every platform. Use your company’s full name including LLC, INC, or any other title details. When listing your business location, don’t abbreviate for terms like ‘street’ or ‘avenue’ or for suites or office numbers. Remember to keep your phone number fluid as well through every listing, keeping prefix structure the same in each. For instance, if your phone is listed as 888-333-4343 in a directory, don’t list in another directory as (888) 333-4343. Instead, keep the format the same throughout every listing to make it easily indexable for Google indexing. Use Long-Tail Keywords: When posting on social media, use long-tail keywords to help content appear in searches and in related page content suggestions. Use Rich Media: While not required, multiple studies have shown that posts with images or video have higher engagement than those without rich media qualities. Provide Links: When posting content, attach a link to your website or other platforms for increased traffic and maximized conversion rates. Include a Call to Action: Along with your link, provide a call to action that clearly states the end goal for the customer. Including this component can increase click-through rates substantially. Instagram is an Ideal Platform for Displaying Your Skills and Services. As the #1 Social Platform in the Worls, Gaining a Following on Facebook Can Dramatically Improve Conversion Rates. This Fast-Paced Platform is Best for Distributing Content and Spurring Conversation. Off-page SEO efforts can dramatically increase your HVAC website traffic by boosting your SERP rankings as well as maximizing your viewer reach through secondary platforms. However, incorrect off-site HVAC SEO can not only leave your marketing efforts lacking but they can actually hurt your Google rankings. A search engine optimization professional can help you find the correct keywords, platforms, and subject matter that produces results. Each of these elements contributes to your appearance in SERPs and can mean the difference between your company being listed in results and your competition taking the spot. 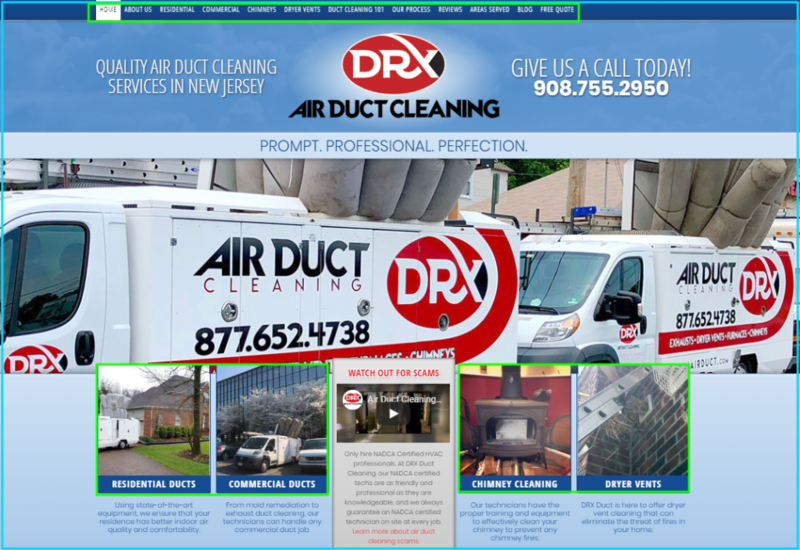 DRX HVAC, for example, uses multiple on-page SEO techniques such as an easy-to-use navigation bar, relevant page links, and rich media content, each with primary or secondary keywords. On-Page SEO Techniques Don’t Just Provide SERP Rankings, but Also a Better Viewer Experience. With nearly 60 percent of Google searches occurring from mobile devices, a mobile-friendly or responsive website is crucial. In fact, Google insists on it. In 2015, Google released an update, now referred to as Mobilegeddon, which added mobile friendliness to the overall Google algorithm. This meant that sites that were previously first in search rankings plummeted quickly if they didn’t have mobile-friendly formatting. Websites that are not mobile friendly tend to have lower rankings than mobile friendly options and return less traffic and conversion rates. 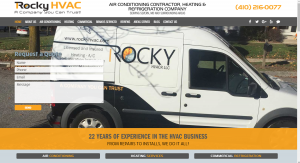 Today, HVAC website owners have an even more fluid option than mobile-friendly web design. Responsive website design provides automatic resizing and adjusting for every type of screen available including desktops, laptops, tablets, and mobile devices. This provides an optimal view of your site, no matter what device the viewer is using. Responsive design is accomplished through specific coding and readily adjusts to the screen to provide easy navigation without the need for scrolling or zooming. The Desktop View has the Most Capability and Can be Fully Expanded. The Tablet View Still Offers Most Design Factors but is Slightly Adjusted to Fit. The Mobile View of Your Site SHould Optimize for teh Smaller Screen and Processor. Many website platforms offer easy to use templates that are stylish and simple to set up. However, these templates possess generic coding that produces no real information for Google or other search engines. Instead of building your site from a template, opt for a simpler site that has productive coding and SEO details that increase your search rankings. After all, even the most modern website is useless if it’s not being found. The structure of your site and pages has a large effect on the user experience of your site. Pages should flow easily into one another and provide inbound links that are relevant and helpful. Your site should have multiple levels of pages, ranging from general top-level pages to specific lower level pages. This helps the user navigate easily through your site, creating a much better user experience, longer exit times, and more conversions. Another aspect that Google takes into account when ranking search results is how many clicks it will take the user to get to a particular webpage from the homepage. If one search link takes four clicks to get to the considered content, while another takes only two, Google will assume the second choice is a more important page and will give it more weight in rankings. When creating your site structure ensure that your HVAC web pages are closely linked to the homepage for best results. Along with your HVAC site’s page structure, the sitemap is crucial for proper SEO effectiveness. The sitemap provides a coded structural outline that allows Google crawlers to easily and accurately index your website’s information for search results. While not required, a sitemap provides code language that’s easier for search engines to index along with page structures and rich media additions so your site is more likely to appear for relevant searches. The Sitemap Logs Your Sit’es Data for Easy Indexing. The URL of your website’s pages is the exact address where the page can be found. The URL is also presented in search results just under the title tag. The creation of a productive URL structure is often overlooked by website owners and can give your HVAC company a leg up in search results if done properly. When considering the URL for your web pages, include the top keyword. It’s also a good idea to keep your URLs short and concise to prevent cutoffs when possible. While top-level URLs should be general, such as ‘yourhvacbusiness.com/air-conditioning’, a secondary URL should be more focused to match its content. A proper lower level URL might be ‘yourhvacbusiness.com/air-conditioning/ac-repair’. This structure provides a clear path for both Google and the viewer, boosting user experience, conversion rates, and search results. As Google bots scour your site, they are searching for keywords and relevant terms that can reveal the subject matter that’s covered on your page. Heading tags provide headlines that Google can quickly index for general content topics. Using keywords and location tags in your headers helps Google crawlers index your information resulting in higher rankings and increased web traffic. But how do you write a good subheading? H2 headers should display the general subject matter with the use of keywords and location tags. H3 subheading tags are best used as secondary headings for H2s, including secondary and service-based keywords for ranking in more specialized search results. The metadata for your HVAC website provides Google and other search engines with easy to read information about each of your page’s content. These details include components, such as the head, title tag, and meta description, help Google index your site efficiently for keyword searchability providing higher rankings on SERPs. Metadata can be found throughout the pages of your site and is considered backend information, meaning that it cannot be seen by general viewers. However, without proper metadata, your site is unlike to rank in keyword, location, or any other type of search performed. Your company’s website header is located at the top of each page of your site and provides useful information and navigation options. The header is where your location and contact information can be found as well as site navigation tools and your company’s logo. This section also provides Google and other search engines with helpful information concerning your company’s location, page subject, and other vital information about your website. Although website templates may provide a fluid header for your website, these cookie cutter sections do not deliver the detailed coding that helps Google index your information efficiently. For best results, use schema coding within the header to deliver easy to read details to crawlers which can help boost your SERP rankings. Like other metadata, the title tag is present to give Googlebot crawlers an accurate idea of your page’s content. These titles are 50-60 characters and appear as the clickable title for each search result on a SERP listing. Each page of your HVAC website should have a unique title tag that includes at least one keyword and clearly presents the subject matter. Optimally, the title tag includes a primary keyword, secondary keyword, and the brand name or location tag. This helps ensure that Google indexes effectively for your keywords and your location or business name. Calverley Service Experts found themselves in the ranking for this Google search, possible party due to the SEO factors in the title tag. The Title Tag is the Clickable Link on Google SERPs. The meta description works with the meta title to give an accurate overview of each page’s content. The meta description contains 120-158 characters and appears under the meta title in SERPs. This description should also be unique for every page of your HVAC site and deliver a clear picture of what the page is about. Effective meta descriptions include a primary and secondary keyword, location, brand name, and contact information. The Meta Description Provides an Overview of the Site Page. Scema.org is a style of emphasizing particular information within your website so Google can index your content easier. This coding style organizes important keywords and details in a structured format that Google bots can easily read for increased searchability. Schema.org coding can be used throughout your HVAC site, from headers to content structure and delivers optimal indexability. The effects of quality rich media on your site go on and on. These additions can improve user experience, create new calls to action, and can even help with your HVAC site SEO. Rich media formats include images, audio, and video, and provide your viewer with an entertaining experience as well as delivering pertinent information and services. However, although rich media can help make your HVAC website more compelling, it must have the correct SEO properties in order to promote your site’s appearance on SERPs. Along with SEO components, your rich media must be formatted correctly in order to provide the best user experience possible. Rich media that are not formatted correctly will rank lower, and sometimes, not at all, in search results. When selecting images and graphics to use on your HVAC website, choose options that reflect the page’s content and company. Use graphs and charts to reflect data and information, and use images of services performed as well as company photos for increased interest in your work. This will help keep your viewers’ attention throughout their visit, reducing bounce rates and abandoned conversions. Images and graphics can also be helpful with SEO strategies if used properly. Each image should have a filename that includes a keyword and should also have at least one keyword in the URL. Alt text is displayed on your site when your image can’t be loaded. However, this field also helps Google index the contents of the image. Use this field to describe the image itself making sure it coincides with the page content. The image title displays when the mouse hovers over the on-screen image and should tie the image in with the alt text. The snippet of content under your image is called the caption. This field provides a more lengthy description for your image and tie-in to the page’s content. Image captions should be no longer than two lines long and should include at least one primary keyword and secondary keyword. Schema Appears on Your Site as a List. 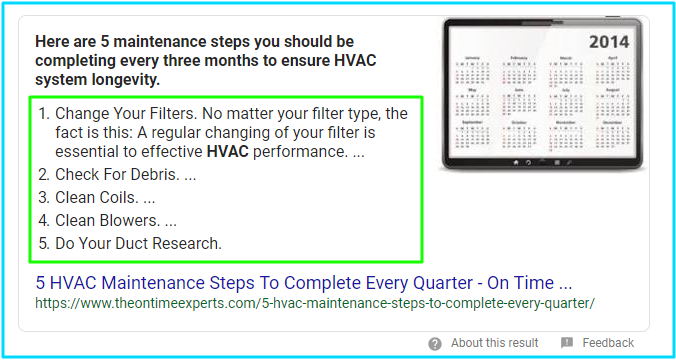 Schema Markup on Your HVAC Website May Help Your Business Appear as a Featured Snippet. Adding podcasts and other audio to your website not only improves the user experience and provide interesting content, but it also delivers SEO opportunities. Most podcasts are hosted by third-party sites such as Blubrry, SoundCloud, or PodBean, and then embedded into your site. This provides a simpler way to display your podcast other than including it on the sitemap. However, if using a third-party host, ensure that the metadata and SEO information is properly completed to get your content seen. Each of your podcasts is listed by recording or episode and grouped by subject in shows. Each of the shows includes a title and description which helps the viewer know what content will be presented. When constructing your podcast show title, include at least one main keyword to help Google index your audio file. Also include multiple keywords, both primary and secondary, in the description of your show which will display on the main search page of your host platform. Once a show is clicked, a list of episodes appears. Episodes have their own title and description and should be approached just as the show details. These fields should clearly display the content’s subject matter and provide a summary of the podcasts using primary and secondary keywords. A List of Relevant Podcast Shows Will Appear Along With Descriptions When a Search is Performed. Episodes are Listed on the Show Page With Titles and Descriptions. Video media additions on your website deliver a multitude of benefits other than improved user experience and increased conversion rates. In fact, adding video to your website can elevate your SERP rankings and produce additional avenues of searchability. When you upload your video to a hosting platform such as YouTube, you are able to add a title and description as well. Adding these fields increases SEO and searchability. Your title should be clear and short, with at least one primary keyword. The title will be displayed in YouTube searches, Google searches, and on YouTube browse lists according to relevance and quality. Along with the title, the description of your video will be displayed. Just like with traditional searches, video searches use keyword and relevancy measures to define your content’s rank. Ensure that your description is clear and contains multiple keywords for optimal indexing. Third-Party Video Host Sites Offer a Multitude of SEO Options. When a search query is completed in Google, bots crawl each website to identify which should appear in search results. In order to index site information quickly and efficiently, Google uses keyword identification to detect similar content and subject matter. Using keywords in your HVAC website’s content can drastically improve the chances of your company appearing in SERPs. Useful platforms and programs like MOZ and SEMrush provide information that can help you identify the best keywords to use on your website to boost your HVAC SEO. Also known as top or primary keywords, these terms are the top searched terms across the nation. They are usually general terms such as ‘residential roofing’ or ‘roofing service’ and while they return a great number of searches, they are more difficult to rank for, especially in highly populated areas. National or primary keywords should be utilized for top-level pages and in lower level pages along with other forms of keywords. These terms are also helpful in meta titles and meta descriptions to offer a more general response. While national keywords are helpful for general searches, local and service keywords help in local and service-based searches. These terms are more specific and, while they aren’t searched as often, they tend to produce more promising results and higher rankings. Keywords like ‘corrugated metal roofing’ and ‘roof leak repair’ are specific terms that may carry a lot of weight with particular searches. Adding a location tag to these types of keywords can drastically improve your local search rankings. Ensure that you rank for as many searches as possible by alternating the location tag from front to back. ‘Shingle roofing in Dallas, TX’ and ‘Dallas, TX storm damage repair’ are both good options for Dallas, TX longtail keyword options. One of the most crucial aspects of HVAC SEO is an accurate assessment and measurement of productivity. Google, along with multiple other platforms, offers analytics tools that can give you the information you need to measure your website’s effectiveness and make any necessary changes. From conversion rates to bounce rates, each metric delivers specific information that can tell you how well each page of your site is doing and what should be changed to get more ROI. Google analytics metrics are updated regularly and provide detailed information including keywords used to find your site, pages visited, and even the length of each visit. Google Provides Multiple Helpful Analytics Tools. Digital marketing is today’s leading channel for expanding your reach and increasing your customer base. However, HVAC SEO techniques and website management can be taxing on a busy business owner. Along with extensive online management services, the experts at Contractor Webmasters provide HVAC SEO planning and implementation that gets your HVAC company noticed. Our Professionals are Experienced in All Facets of HVAC SEO to Ensure You Get the Return You Want. 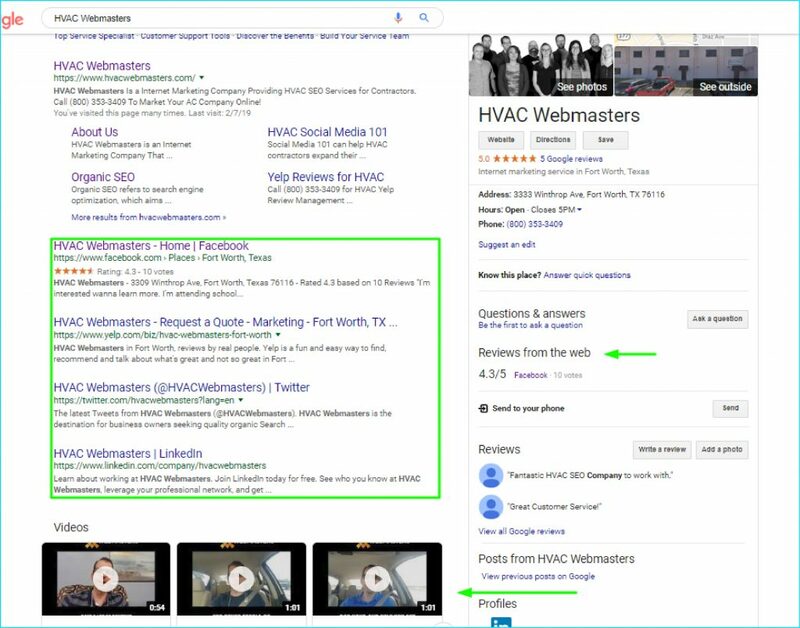 When you’re looking for better HVAC SEO results, call the Contractor Webmasters team at 800-775-1250 to find out how we can help you get online results like never before. Do you know what really makes me mad about SEO companies in 2019? Find out by watching the video above or listening to the podcast below. You can also listen to the Contractor Marketing podcast on Apple & Stitcher. Listen while you are driving to a job. Roofing companies have always benefited from strong marketing campaigns but in today’s digital landscape, service promotion looks far different than it did back 20 years ago. Tech savvy companies like Amazon, Apple, and others have taken full advantage of everything the internet has to offer to businesses and brands in 2019. Roofers have been less aggressive in pursuing the modern tactics that help grow businesses both locally and nationally. Many contractors don’t like to compare themselves to national conglomerates and for good reason. Attempting to become Amazon.com is not realistic emulation for a local roofer. With that being said, roofing companies can still utilize many of the same concepts and apply it to their own marketing strategy. You might be surprised by how impactful the results can be. The number one digital opportunity for local roofing contractors is Search Engine Optimization (SEO). It can help generate leads, efficiently, quickly, and sustainably. Roofing SEO is a series of digital tasks aimed to improve a roofing company’s ranking and overall visibility on Google search results. If you run a roofing business in Denver, CO your number one opportunity for lead generation is Google search. When local residents search terms like “roofer in denver” on Google, they overwhelmingly choose one of the top ranking results. On a Google search engine results page (SERP) there are multiple variations of results. There’s Google Maps listings (The Local 3 Pack) and traditional organic results. There’s also other types depending on the query. Some examples of additional types include featured snippets and knowledge graphs. The more represented your company is on each of these variations, the better chance it has to receive clicks to its website or profile and to subsequently receive phone calls inquiring about your roofing services. A click on your website, or in some cases; your Google My Business listing, does not automatically equate to a sales conversion. For this reason, SEO is a process that can only be maximized if the website and, or listing has a favorable conversion rate. Optimizing your web entities for conversion is an extension of SEO as a general principle. Examples of conversion rate optimization (CRO) include displaying an urgent call to action (CTA) as well as facilitating a convenient user experience. 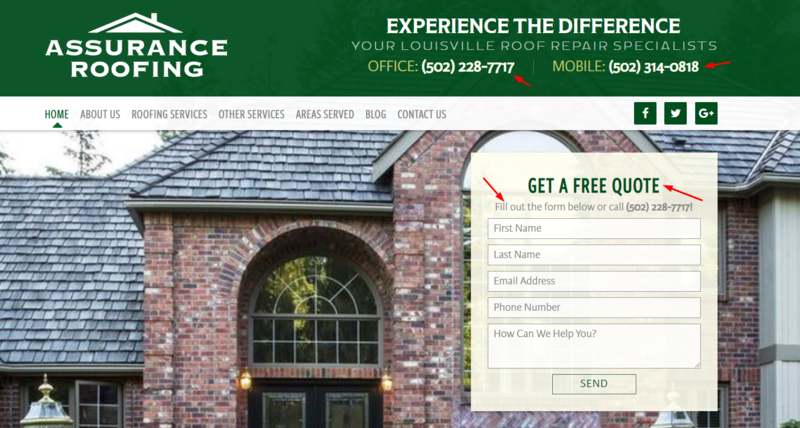 For roofers who frequently use PPC, they understand the importance of landing page. Someone who clicks and ad won’t necessarily choose the service without a strong landing page. This same idea is true when drawing in traffic organically. The process is not over until a sale is converted. Prior to the internet’s emergence, most roofers got their leads through the Yellow Pages, word of mouth, and occasionally some door to door flyers. Fast forward to 2019, and the vast majority of leads come online. When would-be consumers come home to flyers, a typical reaction today is shredding them into pieces and dumping them in the trash. The Yellow Pages? Those are burning up in a household fire pit. Word of mouth? Well that has expanded online as well. People still care about reputation, but their neighbor is no longer the go-to source. That’s because platforms like Google, Facebook and Yelp provide verified reviews of businesses within a local community. If 20 verified Google users endorse your roofing services, you better believe it will have a direct influence over the amount of interest your company generates online. Word of mouth now travels at the speed of the nearest internet connection. And don’t think Google doesn’t notice. Maps rankings in particular are heavily influenced by the overall reputation of a business. In short, reputation management is a factor in SEO. Every great SEO campaign starts with a well researched and well developed plan. Conversely, porous optimization campaigns are done on-the-go. Before a roofing company website can rank it must have a target keyword (or many of them) to rank for. These keywords are targeted based on their relative search volume and opportunity. But keywords are not the only aspect of SEO preparation. As a roofing company, you must clearly define what your services are so that the appropriate research can be done to align them with logical keywords. Service types and keywords will also instruct the basis of your site’s URL structure and hierarchy, both of which are incredibly influential in search ranking, primarily because of how Google bots crawl a webpage. Several tools are available to assist in keyword research .Some of the most notable ones are MOZ, SEMRush and UberSuggest. MOZ and SEMRush are actually highly intuitive tools that expand beyond simple keyword research UberSuggest is strictly a keyword tool, but is also free of charge to use, which is not the case with the others. 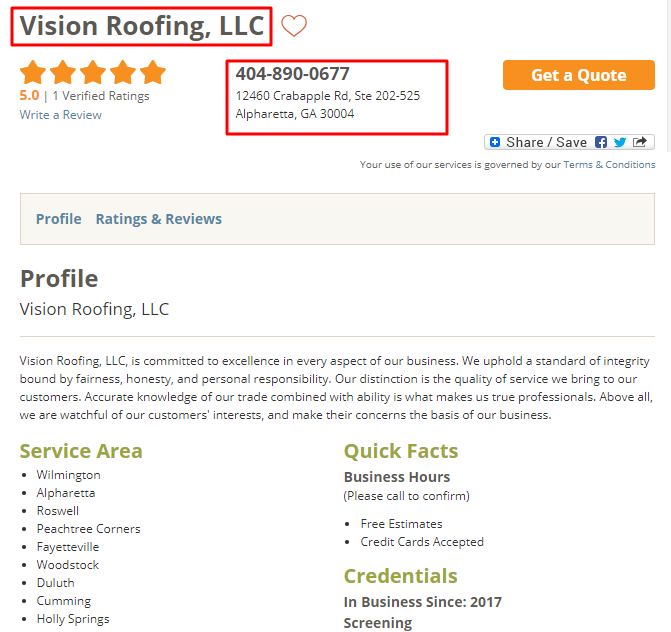 If you run a roofing company in Baton Rouge, NO, the types of keywords you’ll want to target are “roofer baton rouge” “baton rouge roofer” and variations of that nature. The good news is that these keyword tools often suggest similar keywords and rank them based on volume and opportunity. Identifying the right terms is not especially difficult if you understand what makes a keyword valuable in your industry. Keyword research on a term like “roof repair” is going to yield national search volume, competition, etc. The quandary many roofing contractors face is that their services are not on a national scale. They service a defined local area and the national competition therefore is not indicative of what we’ll call “real competition.” So when studying general industry keywords, understand that competition level on a national scale will not mirror your own service area. The main thing to analyze for national keywords is search volume. One can assume that if a service is in high demand across the nation, it is going to be similarly popular in your area. That is not a 100% certainty because of seasonal and climate disparities which we’ll touch on later. The true value of keyword research is identifying local keywords with high opportunity. For local roofers, opportunity has several prerequisites. For starters, a keyword worth pursuing for roofing companies is transactional. What this means is that the intent of the keyword is for the searcher to find a service they are ready to pay for. 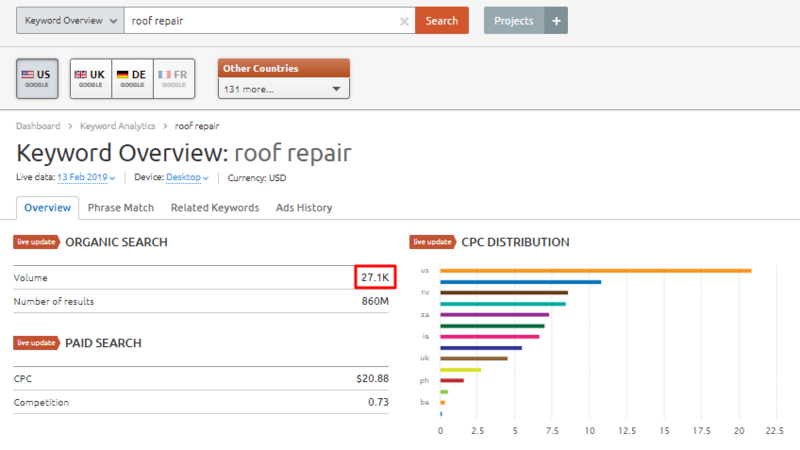 In contrast, keywords that are informational, are far less valuable to a roofing company. For example, a query for “how to fix a roof” is going to yield high volume. But it is not going to be searched by people ready to pay for your services. They want information about how to perform their services on their own. With this knowledge, you can eliminate traffic from users who will not lead to sales conversions and focus on those who might. Many times keywords that rank fastest are those that are long tail. A long tail keyword is typically either a combination of two or more keywords or an extended version of a single keyword with qualifiers added. 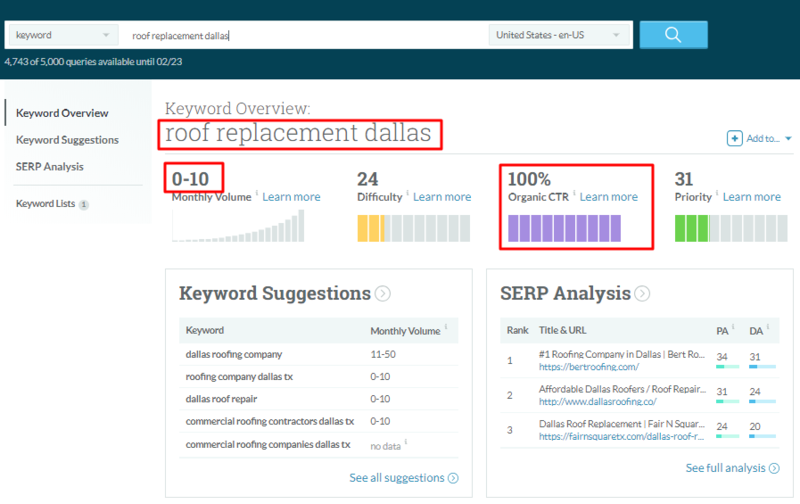 Take for example the keyword “roof replacement.” If a qualifier is added, like in dallas, the long tail keyword would be “roof replacement in dallas”. Sometimes keywords like these are popular enough to register a search volume. If so, you know immediately that your local service area is typing that keyword in on a regular basis. But if no volume registers, that doesn’t mean nobody searches for similar or even exact queries. The goal for long tail keyword research is to narrow a focus while maintaining a distinct relevance. Part of an SEO strategy involves URL structuring. Google and its users prefer a logical and hierarchical URL structure that drills down from top level categories to lower level services. For example, a roofer who does both residential and commercial jobs might have a top level section for each category. Both would then drill down to their own individual service pages. You might have a residential roof repair page as well as a commercial roof repair page. 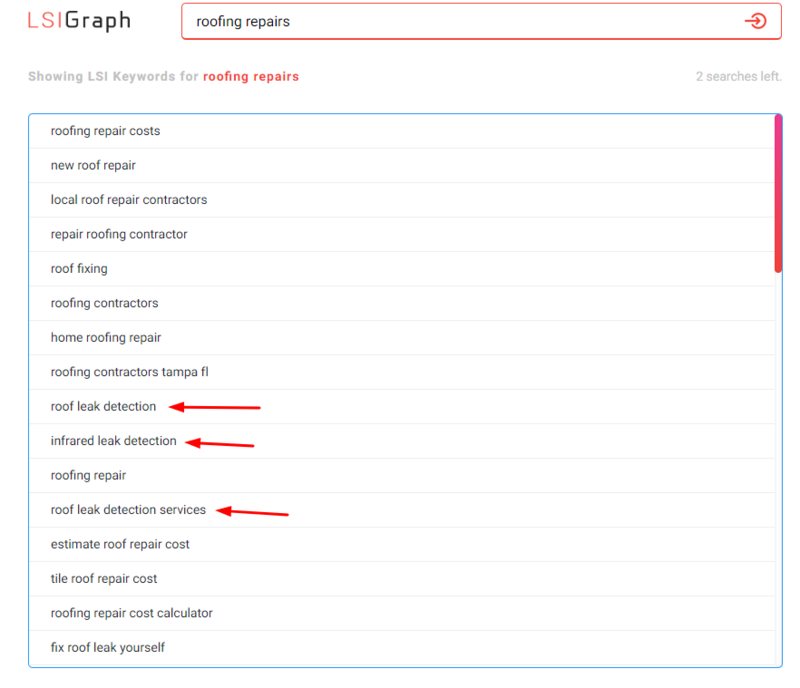 Google crawlers will never mistake the roof repair pages for one another since they are solid underneath parent categories. The same goes for users browsing the site. They will be well aware they are in either the residential or commercial section of the website which of course manifests through search as well. Google’s most recent algorithm update prefers websites that are unique and original. Part of uniqueness and originality is visual content. In 2019, visual content is most commonly in the form of image and video. Photos have been part of SEO for a long time, but it is relatively recently that videos became a considerable factor. YouTube is affiliated with Google as you’ll notice when performing a video search on Google. As you can see there are multiple YouTube results. Producing videos of your roofing contractors on the job can be valuable from an internet marketing standpoint. These videos can be uploaded to YouTube and then embedded directly onto your website. This creates a 3 pronged affect where you get credit on Google, YouTube and your own website. Both images and videos should be unique to your company for optimal SEO. Planning SEO sets the foundation but the real progress is made in its application. Because SEO is such a wide-ranging methodology, applying SEO should be broken down into several categories and even subcategories as a way of organizing tasks. At the end of the day, all of these tasks must be completed, so there’s no sense in attempting to do them all at once. They will end up not getting done right, or not getting done at all. Compartmentalizing certain facets of SEO is as important as research and development. You cannot as a roofing company expect to become an expert in search optimization overnight. But you can intelligently implement a process. By taking it step by step, if you will, the end result will be much cleaner than a rushed job. Applying SEO with a pre-developed strategy is far easier than it otherwise would be. Because of the complications that can arise when executing such a vast range of methods, tasks, and principles, a guideline of sorts can be like a road map that keeps the optimizer on task and on schedule. In this roofing SEO guide for contractor, our goal is to create that roadmap and empower you to follow it to a year’s worth of roofing success online. There are no shortcuts when it comes to SEO. Every single detail is not only important but it impacts the other factors that are reliant upon it. The whole is greater than the sum of its parts when it comes to SEO marketing for roofing contractors. When done right, it can pay major dividends for years to come. Did you once win local roofer of the year in a nearby news publication? If so, that honor should be prominently displayed somewhere on your homepage. Why you ask? Because accolades build trust in the consumer and therefore increase conversion rate. We know that prospective customers compare roofers based on reviews, and that same confidence they get from reviews, they can get from verified badges of honor. Roofers can get awards and certifications from all different kinds of sources. Some can even display their features from newspaper publications, magazines, etc. The more you can establish credibility based on external sources, the better you’ll be. To measure the performance of a website it must be tracked via Google Analytics. With Analytics tracking, roofers can measure the traffic coming to their website as well as the various sources and channels through which that traffic originates. Installing Google Analytics is not difficult and is free to use. The data produced form it is extremely valuable because it is coming from the most authoritative source; Google itself. Think about the goal of your website which is to generate leads through Google. There is no better way to understand how to improve rankings on Google than by analyzing the data produced by Google’s very own tracking device. A website is the foundation of every roofer’s internet presence. Back when SEO was first popularized in the mid 2000’s, a website was really the only way of finding a roofing company oinline. Today in 2019 that is no longer the case. Now there’s Google My Business, Facebook, and a multitude of other business directories and social media networks, along with other web properties throughout the net. Despite these collective emergences, websites are still the central hub that connects all of them in a cohesive manner. Strong websites are designed with custom codebase and aesthetically pleasing visual display. They are also extremely mobile-friendly and display properly on every type of device. Template websites simply won’t be good enough in SEO. What makes a website visitor call your office? A call to action. Once they like what they see on your website, the next step is to call your office. Let’s be honest, roofing customers don’t want t o read a novel about what your roofing company can do for them. What they want is a clear and urgent reason to contact you. The best calls to action are prominently displayed on a website’s homepage along with any other page that is frequently visited. Clickable phone numbers are a particularly effective CTA because of the percentage of visitors that access websites via mobile device. By simply clicking on the phone number, their smartphone will connect directly to your office line. The only thing left to do as a roofing contractor is to close the deal, which you are used to. Because a roofing website is the central hub we described it as, it is critical that contact information is listed on the footer of the website, if not in other areas as well. The info must be accurate, consistent, and visible. Matching this contact information with other business directories like Google My Business is one of the most important considerations in SEO. Since all other web properties link back to your website, the information regarding your contact must be uniform. You’ll learn more about the importance of listing uniformity when we discuss NAP citations later in this guide. Suffice to say that during the design process, space must be reserved for this information. Badges build trust but nothing builds more trust than customer feedback and reviews. Consumers can find your reviews on 3rd party platforms like Google, Facebook, and Yelp, but a strong website will also showcase these testimonials directly on the homepage. You can even invest in a widget from Contractor Webmasters called Righteous Reviews. This widget populates reviews from around the web (Google, Facebook, etc.) and publishes them directly on your website. It also has built in technology that sends a text reminder to serviced clients along with direct links to your reviews page. The convenience this plugin presents can increase the frequency of feedback which as you may know, helps establish authority in your local market. We cannot overstress the importance of videos on websites but multimedia extends even beyond videos. Other forms of multimedia include audio podcasts and interviews as well as interactive web elements. If you’ve never thought about starting a podcast, you should do so now. With so many distributors available online, a weekly or monthly podcast can really spread your roofing company’s brand around the web. There’s Apple, BluBrry, Spotify, and Stitcher to name a few. What will you talk about on a podcast? Your work. Talk about the last job you did. Talk about the different types of roofing materials, the pros and cons of each. You could easily do a monthly episode on roofing. Make sure you specify a topic for each month and name the episode. Most users who access your roofing company website will do so on mobile devices. In fact, the number could be up over 50% depending on which statistic you observe. When you think about the amount of access consumers have to their smartphone and the WiFi internet connections that support them, it’s no surprise that that number continues to increase. With that in mind, roofers must ensure their mobile website is fully optimized. It must appeal directly to the mobile user (the majority of users) and be easy to navigate on a smartphone. Speed is also a major factor for mobile websites. If a site takes more than 3 seconds to load, you can expect the mobile user to exit immediately, thus contributing to an increased bounce rate and decreased ranking. Custom design is important, but so is the customization of website elements. This goes beyond the design itself and extends to images, videos, badges of honor, etc. We spoke briefly about why unique images are good for SEO. Let us make it even more clear. Have you ever seen roofing websites that use stock photos? If so, you’ve likely seen the worst of roofing websites. These stock photos are mass produced and published on an inordinate number of websites throughout the net. They evoke a sense of cheapness and in some cases downright comedy. Google can tell how users perceive these subpar images by their collective reactions to them in the form of user behavior. Custom images, videos and badges engage users longer for SEO. Google Chrome warns any website visitor if the site they are currently browsing is not secure. These warnings strongly discourage the user from staying on the site and generally create a negative perception of not only your site but your company and brand. How do you prevent such an occurrence? With SSL security. SSL is a protocol that ensures your site is secure and gives visitors the comfort they covet when browsing. Sites with an address starting with https:// have this protocol installed while addresses starting with only http:// do not. Although it is not confirmed to be a direct SEO factor, users leaving your site can only hurt search ranking. Because the roofing industry is so location-specific, SEO application must be tailored to a defined service area, i.e. geographic location. As a company in business, you understand which zip codes you can reasonably service. These are the ones you should target online. Keep in mind that the city in which your address is located is the one that Google will observe your business as most closely associated with. It is this city that Google will give you the most credit, particularly on Google Maps results like The Local 3 Pack. There are ways to also rank for other nearby cities which we will discuss as this guide progresses. Focus first and foremost on dominating the general area in which you service as a roofing company in 2019. You can expand thereafter. What about roofers who have offices in multiple cities? Ah yes, the multi-location roofing company. There are certainly contractors successful enough to own and operate a 2nd and possibly even a 3rd location. 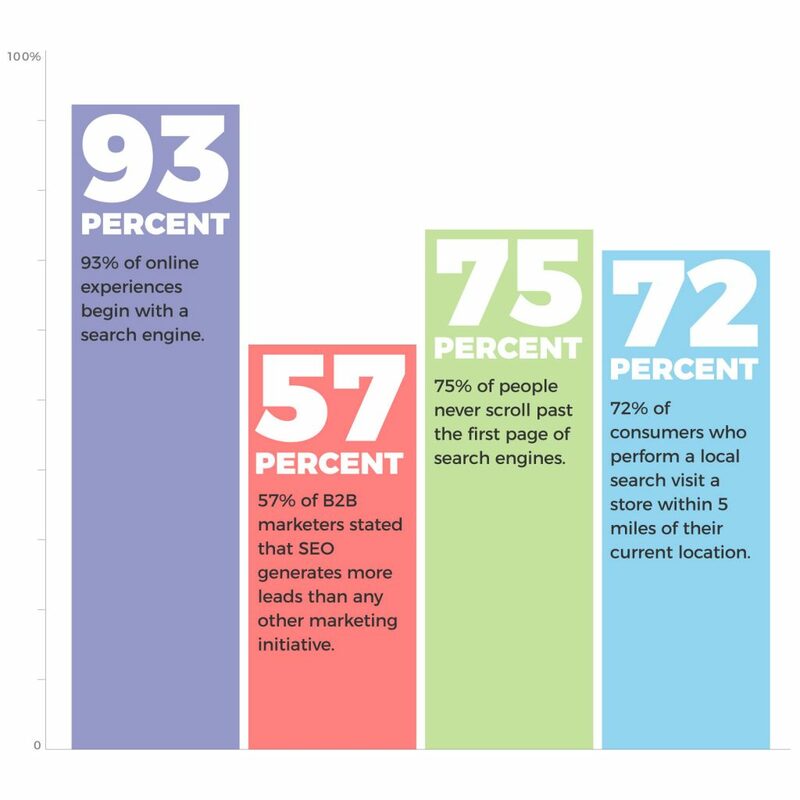 In cases like this, local SEO becomes a little bit more extensive, but the general concept remains the same. The difference is that each location will have its own Google My Business account and Maps listing. These individual properties will then be linked to an internal page on your website. For example roofingwebsite.com/locations/houston would be the URL for your Houston location while roofingwebsite.com/locations/galveston would be the URL for your Galveston address. They each have their own set of NAP citations and so forth. Although the Yellow Pages are dead in practice, their concept still exists, albeit in digital format. In fact, there is an online directly called the Yellow Pages. But there are so many more of them as well. The most well known ones go far beyond the label of a citation. Google My Business, Facebook, and Yelp for example are all platforms on which to cite your company’s name, address, and phone number. But there are also smaller niche directories throughout the web like HomeAdvisor and Angie’s List. If you find that your business has citations that you never manually entered, it is because the information was pulled from a data miner like Acxiom who collects business info from public records. If an inaccuracy exist, the data miners are a good place to go first and correct them. This way, they will be distributed correctly from here forward. The presence of citations is important in of itself, but the cohesiveness of all of them combined is what really influences local SEO. Claiming citations across the web can be a massive project. That’s why tools like Whitespark, MOZ Local and Yext exist. Any inaccuracy can be a hindrance to your roofing company’s local SEO. Not only does it confuse Google about your contact information, but in worst case scenarios, it can create an opportunity cost through lost leads. A phone number off by one digit for instance can lead to would-be phone calls not getting through to your office line. To think about it from a logical standpoint, what is more trustworthy? A roofer who has consistent NAP information or one that has multiple variations that confuse consumers? Google My Business is the most important local business directory on the internet. Because it is a Google property, the information submitted on My Business is of the utmost importance. 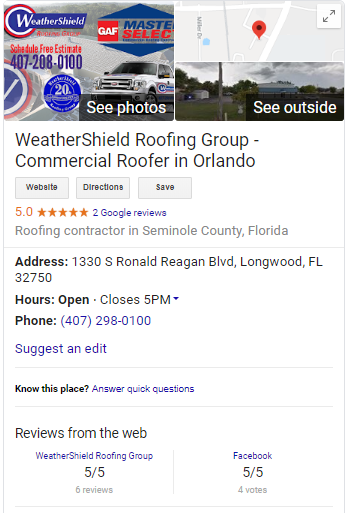 When users perform a branded search of your roofing company, part of the SERP will likely feature a preview of your Google My Business listing. If properly optimized, this will help build trust and authority in your web presence. Google My Business can be optimized beyond accurate and consistent NAP information. 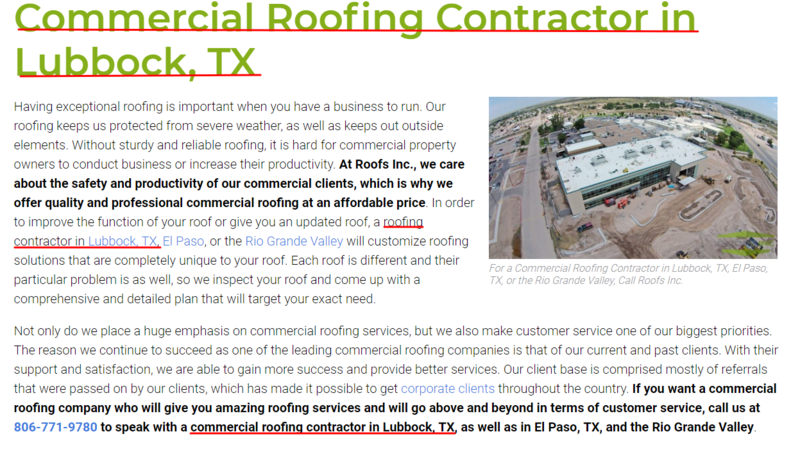 Roofers can add original company photos, answer frequently asked questions, and even create and publish Google posts. My Business is also connected with Google Maps making it a critical aspect of your local SEO campaign as you pursue clicks. Roofing companies often have a single business address within a city but still wish to serve surrounding areas that are within reasonable driving distance. Since Google attempts to match local users with local roofers, consumers closest to your address will be the ones most likely to find you on search, particularly in the Local 3 Pack. That being said, there are ways to expand your reach on search engines. One of those ways is location page optimization. You can create city pages that are unique and well written and appeal to users in that specific area. One way to specialize a location page is by displaying reviews from customers of yours who are in the corresponding area. For roofers with a general understanding of SEO, they most commonly associate it with on-page optimization tasks. From the editing of title tags, header tags, and meta descriptions, to the production of seo-friendly content, on-page tasks are widely recognized, even by novice SEO’s. On-page optimization is also closely associated with keyword research, as the keywords identified during the process are those that are then inserted within the tags and content on a given page. As SEO has progressed in terms of Google’s algorithm, the necessity for diverse (semantic) keywords has become more prevalent. Still, on-page factors remain vital to search ranking. 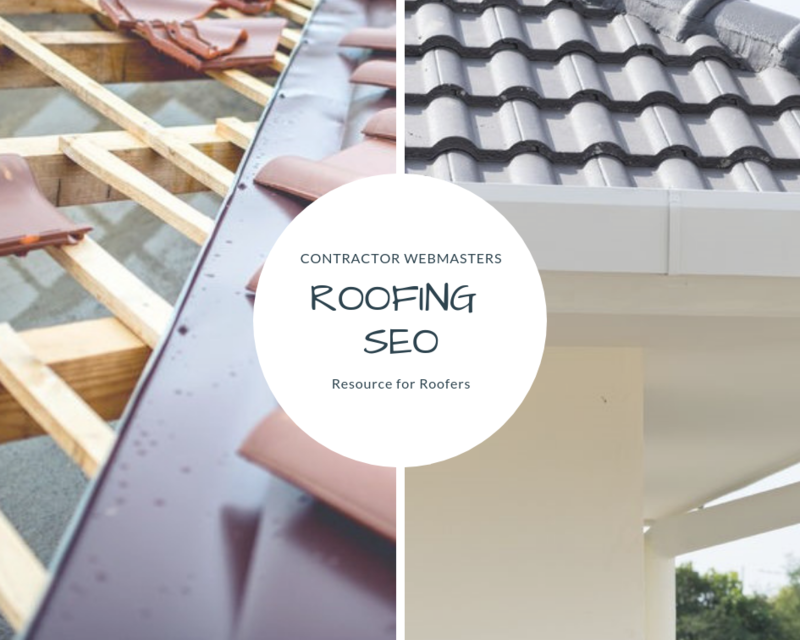 For roofing companies without many connections, on-page SEO becomes the easiest way to increase search traffic. If there’s a criticism of on-page SEO it is that it takes time to implement. Changing a title or meta tag won’t pay immediate dividends for roofers. Depending on the age of the domain and its current ranking, the period of waiting can be anywhere from a few days to 6 months. 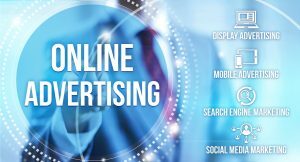 For this reason many roofing contractors pursue a short-term solution in the form of PPC advertising. PPC ads yield immediate clicks. The problem is that each click drains your budget and traffic ends up costing a considerable amount of money to sustain. Once established, SEO can begin to provide more traffic for no cost per click. The ROI resulting from this achievement is disproportionately greater than any other form of online marketing as of 2019. SEO works well. On-page SEO often delves into detailed minutiae and one prime example of this is image alt text. Most people think that something so small cannot possibly make a difference, but it does. Google scans images and since they cannot actually read the context of the image from a visual standpoint, they rely on its alt text to define it. Optimizing images for web use involves renaming the file to lower case letters, uploading the file onto your web server, and tagging it with appropriate alt text. Let’s say your roofing company logo is the file. It should be called company-name-logo.jpg and then tagged with the alt text “Company Logo.” The same process would be used for all of your images, whether they are of equipment, jobs, or anything related. There’s multiple kinds of headers in HTML. H1s are the most important heading from an SEO standpoint. Google pays close attention to H1s when defining a page’s relevance. H2s can also have some impact on how Google conceptualizes a topic. H3s and higher are more for formatting purposes but because they help the user read your material in a more organized fashion, they can keep readers engaged longer and improve behavioral metrics that Google evaluates when ranking a page. Therefore, headers of any kind can have SEO influence, even if it is indirect in some cases. Make sure plenty of content exists beneath each header. Google does not want to see a bunch of headers stacked on top of each other, and neither do readers. Keywords are a major part of SEO and placing them in the correct areas can determine where you rank on Google SERPs. The left hand side of every on-page element (title, header, meta, image alt, etc.) should all have one instance of your primary keyword. Google crawlers read elements from left to right, making the first part the most important. Body content should also have at least one instance of a primary keyword. Google’s algorithm has evolved to weed out keyword stuffing so using the keyword more than 25 times is not recommended. Instead, primary keywords should be supplemented with a collection of LSI keywords to add semantic relevance to the on page content. Remember to place keywords naturally within page elements so it does not compromise readability. Aside from the title tag, SERP results also display what is known as a meta description. It is the text that appears beneath the title tag or as you know it; the blue link on the SERP. Descriptions should also contain one primary keyword while explaining what the page is about. 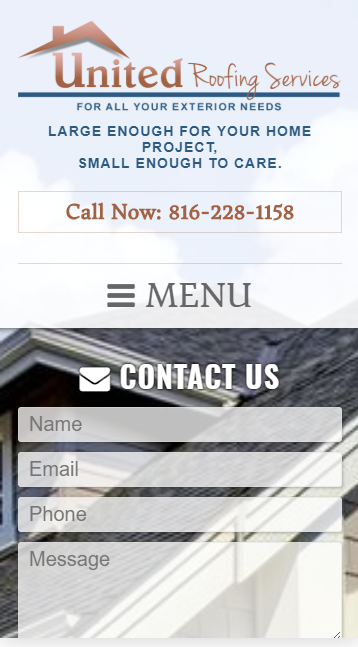 For roofing companies the meta description can also contain a call to action, such as a phone number. What you’ll learn is that consumers with roofing issues are generally looking for a way to contact your service company so that they can explain their issue and find out whether or not you can fix it. With this in mind, don’t mislead the user through an inaccurate description. If they end up clicking through to an irrelevant page, they will quickly exit and increase your site’s bounce rate. If you’ve ever visited a webpage that is not a homepage, you’ve likely noticed an extension at the end of the web address. Take for example: roofingcompany.com/roofing-services. The portion of the URL that says roofing-services is known as a permalink or URL slug. 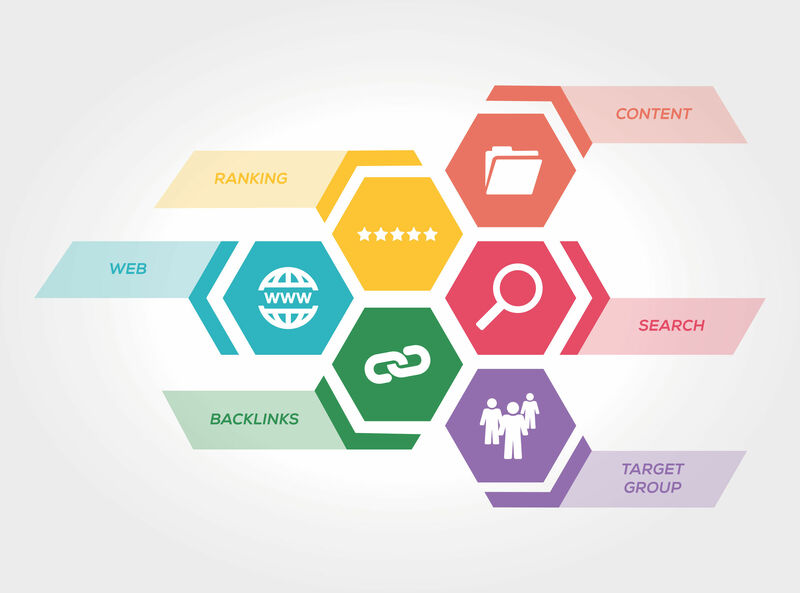 These permalinks are very important to SEO. The slug should contain your primary keyword and nothing else. That means no stop words like in, and, or anything similar. The shorter the permalink, the easier it is for Google to crawl the URL and the more likely they are to categorize it appropriately. Make sure the permalink is highly relevant to the on-page content as well. We told you that Google’s algorithm has evolved to discredit pages that stuff keywords within content. In 2019, Google prefers to see a few instances of primary keywords supplemented by semantically related terms which are known in the SEO industry as LSI keywords. You can find which LSI keywords are associated with your primary term or topic by visiting LSIGraph.com and performing a basic search. The related keywords are sometimes synonyms and other times terms closely associated from a topical relevance standpoint. Either way, Google and its users enjoy content that is more robust and provides a superior user experience. A page about roofing repairs for example, should also mention leak detection, mold removal, etc. since they are relevant to one another. A title tag or SEO title is the blue link you find on a Google search result. It is also the text that appears in the tab on your internet browser. Titles are tagged within the HTML to help Google define the page. Using the Yoast plugin on WordPress, roofers can add title tags without knowing HTML. A title should have a keyword within it but also have a sales pitch of sorts. The goal is to not only help Google define the page, but to give users a reason to click on it when they see it. An example of a roofing company SEO title would be Roofing in Detroit, MI | Request a Free Estimate Today!. You can use MOZ’s title tag preview tool to make sure your title will appear correctly once indexed by Google. Most titles should be kept under 60 characters. For a Contractor SEO company that can boost your roofing company to the top of search engines, choose Contractor Webmasters. We have a staff of 20 webmasters who are skilled in website design, SEO, and link building. We have hundreds of roofing clients throughout the nation and hope to add you to that group in the near future. Whether you are a roofer with years or decades of experience, or a company just getting your feet wet in the industry, we can help establish your web presence and create a sustainable lead generator that will serve your business well not only for years but for decades. The best part is that our services are highly affordable. No single person can perform all SEO tasks on their own, which is why you need a team. Call Contractor Webmasters today at 800-775-1250 and ask about Roofing SEO!